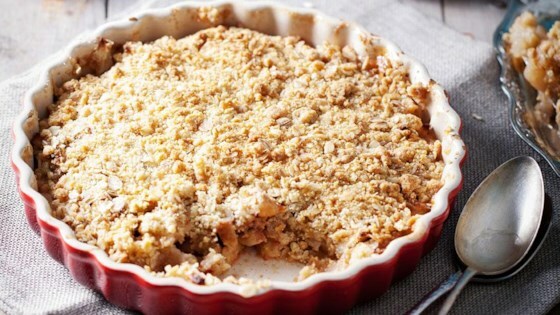 "The perfect apple pie alternative  a streusel cake! Made with Stevia In The Raw for less calories and sugar."
. In a large bowl of a food processor fitted with blade attachment combine flour, brown sugar and 2 tsp. cinnamon. Pulse until well combined. Add butter slowly, pulsing between additions, until pea-sized pieces form. Press 1/2 of the mixture in an ungreased 9-inch springform pan; set remaining mixture aside. Place apples, Stevia In The Raw(R), cornstarch and remaining 1 teaspoon cinnamon in a large bowl; stir to combine. Place apples in prepared springform pan. Evenly sprinkle the remaining mixture over apples. Place springform pan on baking sheet with sides. Bake 60 to 70 minutes until top is golden. Remove from oven. Run knife around the edge of pan; let cake cool completely. Remove springform ring just before serving. Cookies and pie are perfectly delicious together! I want to make this, it looks delicious!! But the picture doesn't look like it was made in a springform pan! Stevia in the Raw is way too bitter. I prefer milder stevias without the intense aftertaste. Wholesome is the best because it's organic and clean. This recipe need help----1 1/2 cup of butter is 3 sticks.......THATS A LOT OF BUTTER. I did not make this. This is the most fantastic cake I've ever made! My family insists on it every time we get together. No additions were needed. Simply Fabulous!